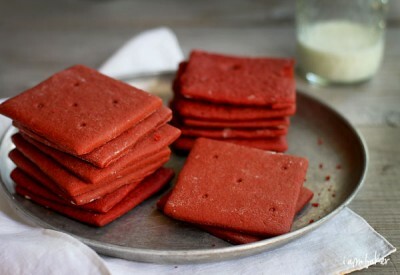 Making Red Velvet Graham Crackers is a fun and colorful experience! Use them in cheesecakes, smores, or just grab one as a snack! 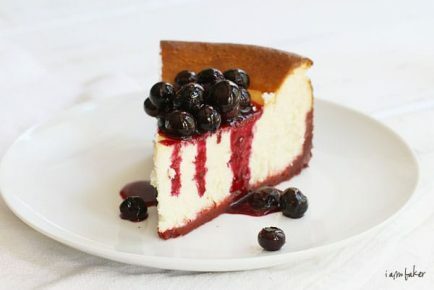 UPDATE: Here is the New York Cheesecake with Red Velvet Crust! 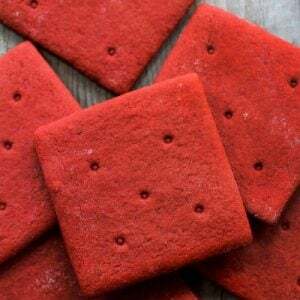 As I could smell the sweet aroma of fresh, homemade red velvet graham crackers in my oven, I could feel my anticipation level rise. I just knew these were going to be good. One reason is I started off with an amazing recipe. 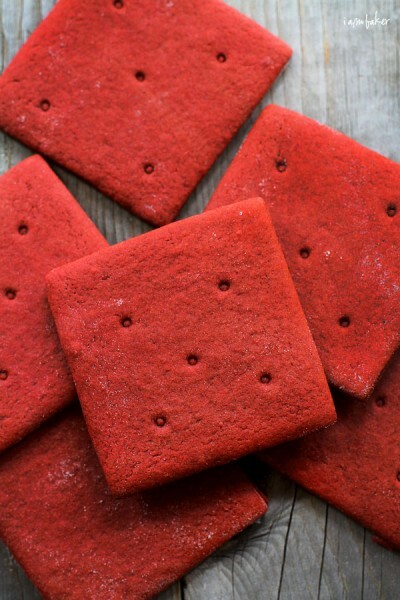 This Homemade Graham Crackers recipe from Smitten Kitchen. It’s wonderful and lent itself so beautifully to a Red Velvet adaptation. I only had to make a few key changes! Another reason is… hello… is Red Velvet! We already know I am obsessed right? I found that these cookies most tasted like a graham cracker on the second day, or after they had hardened slightly. I also placed the cooked and cooled crackers in the oven at 170 degrees for 30-40 minutes to dry them out more, and this worked well. Keep a close eye on them in the oven. Deb’s original graham cracker recipe called for 15-20 minutes in the oven and mine were burnt to a crisp at fifteen minutes. (makes sense since I changed the recipe!) I adjusted my time to about seven minutes and that worked well. We thought these would make amazing s’mores. Although I tried some funky variations (fruit and puree’s and different chocolates) that original seemed to work best. Red Velvet graham cracker, marshmallow, and chocolate. Delish. 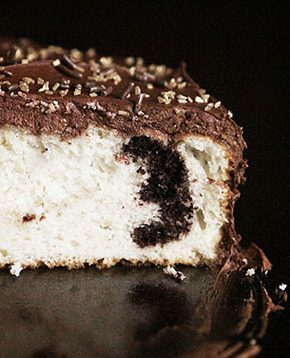 Try making the ultimate S'more with this fun recipe! In the bowl of a mixer, add brown sugar, flour, baking soda, cocoa, and salt. Mix on low to incorporate, then add in butter cubes. Slowly increase speed to fully incorporate butter and reach a coarse consistency. Measure out 1/3 cup honey in a larger size measuring cup. (Like a one or two cup) Add the buttermilk, food coloring, and vanilla to the honey and mix together. Add honey mixture to flour mixture and combine on medium speed until dough comes together. 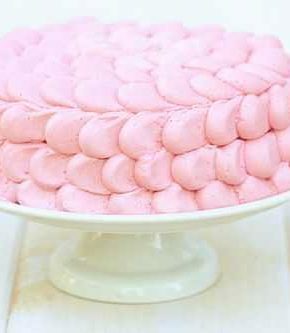 Pour dough onto a well-floured surface and roll out. Try to make dough 1/8 to 1/4 inch thick. (just be consistent) You can use a square cookie cutter or cut out rectangles, whatever you prefer. I used the top of a #3 tip to make little holes in the top of some cookies. How creative and fun. 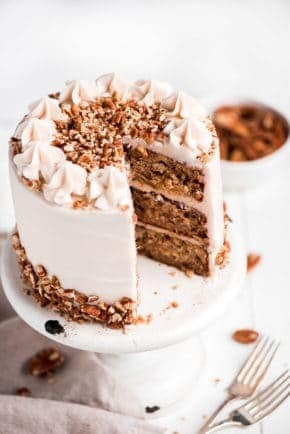 What a great way to make a classic dessert into something new! It is supposed to be there, but is not currently working. Please check back in a day or so! okay, thank you! 🙂 i’ll let you know if the recipe still hasn’t appeared. 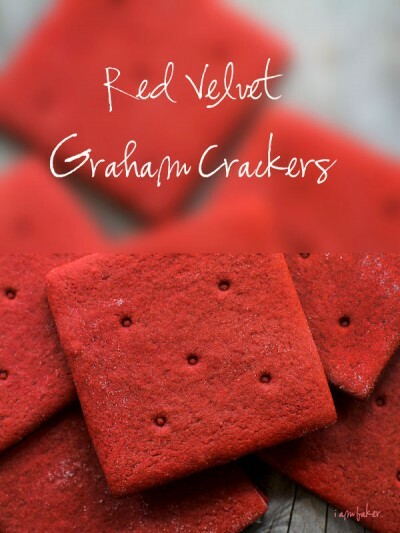 funny – i’m not that into graham crackers or red velvet stuff – but i really really really want this! I have been checking back off and on for a week to see if the recipe came up and now it has. Going to make them today! Another UKer who’s never knowingly eaten graham crackers (I think they are more like cream crackers than digestives….but what do I know? ), I had to google s’mores too. They are very lovely little biscuits though and I do love marshmallow guys. Is there something that I can use instead of honey? I can’t eat it, so I was wondering if you had any suggestions. 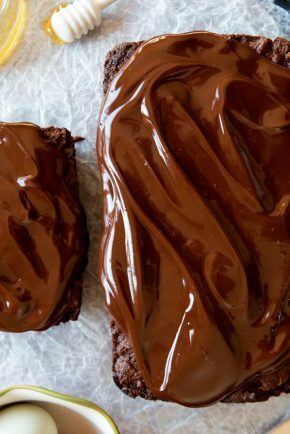 A reader just sent me this link b/c I made homemade graham crackers and she said she made your red velvet one. They’re beautiful, Amanda! The recipe is not visible either via the email link or on your website. How do I get it?